What makes this prolific artist such a sales superstar? Guest blogger Natasha Wescoat shares her secrets. A well-rounded web presence is an essential part of your art business and brand if you want to sell online. Like any brick and mortar gallery, it’s the collector’s main source to the artist and stands as an authority and representation of you across the web. In 2004, I began selling my art online through auction websites and established a presence through the social networking blog Livejournal. I then started my own website, which has evolved over the years through trial and error. I’ve found the keys to a successful website. As an artist, your work should be representing itself. There is no need for fancy design or flashy colors. It should remain clean and simple, either in black, white or neutral colors. You want your art as the shining attraction here! Stay away from moving images or flash, noisy fonts or images that have nothing to do with your artwork. As always, with any site, the information and content you use is vital not only to driving traffic, but to inform your collectors and potential clients. You want to have all they need to learn about you, the artist, about your work and also most importantly, what you are offering THEM. About: This page is dedicated to describing you and your work. Your biography, artist statement and resume can go here as well as pictures of yourself (especially creating the work!) or if you remain a private person, some clever childhood photo of yourself for example. Make sure you have written a well thought out biography and statement. This can take time but is the foundation of your career. Gallery/Portfolio: Whether you place them directly on your site (which I recommend) or you link to another site (Flickr, Imagekind or Photobucket, etc.) there should be easy access to look at your work! Be sure to include any past collections of art, present work, available work or projects you have done. Always add descriptions or captions on the art, along with a copyright statement and even links to where they could purchase it, if elsewhere on the web. News/Updates: This page posts the latest news on your upcoming projects, events or sales. You could even connect your blog to this as blogs are a great way of updating people. Always announce stuff you plan to do, have organized to do and even the sales you want to put on. Create anticipation for your buyers and fans. Contact: Make yourself as available and accessible as you can. Not only would it be good to provide your contact information here, but also include the information across the other pages of your site. Links/Shop: Make sure you have posted links to every social network, online shop, print company, licensee, etc. that you use or who sells your work. This provides verification that those sites are really you and they help people find those other sites. You’d be amazed at how little your fans know about other websites or even what you’re doing. When writing the content for your site, from your bio to the descriptions of artwork, it’s vital to understand how keywords and SEO works. You want to make sure your content is full of the keywords that describe you and your art, so that when people search for art like yours on the web, your site is the one that comes up! Also, linking to other pages in your site from another page is important. Some people need a bit more help in navigating websites and can’t always understand or find something, no matter how easy you make it. An example of what I mean: My About page, I may write a sentence that says, “For more info, contact Natasha…” The word “contact” could be linked to the contact page or even directly to my email address. If you are offering a sale, running a new club, or joined a new social network, you should highlight that somewhere on the front page. If you can, create a banner or box that advertises this and link so they can go to it. A website is not complete without its supporting character – the social network. Whether you use Facebook, Twitter, Pinterest or MySpace, those sites will help create even more traffic to your main site. If you want to be a successful artist selling your work online, you really shouldn’t attempt a business without it. Over the years, through discussions and making friends, I’ve found business opportunities. You can’t force it, but you should develop a reputation as a person as well as an artist. Make friends and new connections. Add value to their life. See how you can help or promote them. Don’t always blast or broadcast what you do or sell. No one responds to that. Learn what your collectors want. What they like. Who they are. Connect. I’ve found this to be one of the most complex but important parts of a successful art business. Without it, you don’t really have much. It’s important to research and develop your social media strategy, your execution plan and how to use it. It’s the most affordable way to promote and advertise yourself. It took me many years, but because I already loved to learn about the web and adopted technology all the time, it just became part of what I do. And last but not least, make an effort to attend conferences, art shows, expos or fairs that are local and national. Find ways to connect with your fans, your artist friends and potential business opportunities in person. It’s always valuable to add a face to the profile. Online is not always enough, though it will be biggest part of your business. Offline events are still vital and beneficial to your art career. Love ARTSYSHARK for bringing you to my computer. Great insite for a successful online business. Thank you. Great information. You’ve showed me of a few things I need to focus on to improve my website. Thanks Natasha and ARTSYSHARK! Thanks, Rob. Natasha is a real pro. When she contacted me about writing an article, I jumped at the chance. Her website is an example of how to do things the right way! Well told and informative. Love your art! Lots of useful information here. 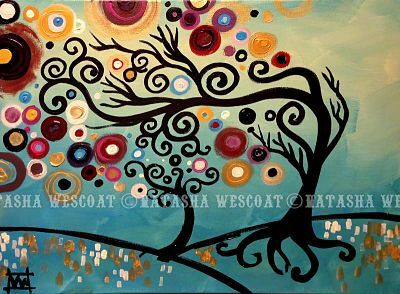 I too am an artist of Whimsical Tree Art and love the creative dreamlike qualities that inspire within. I’ve been trying to implement some of your ideas, it takes time but I hope it helps my online presence. Thanks Natasha, love your colorful work. I agree, Natasha is quite inspirational!